Why Are You at Work Right Now? Seriously. 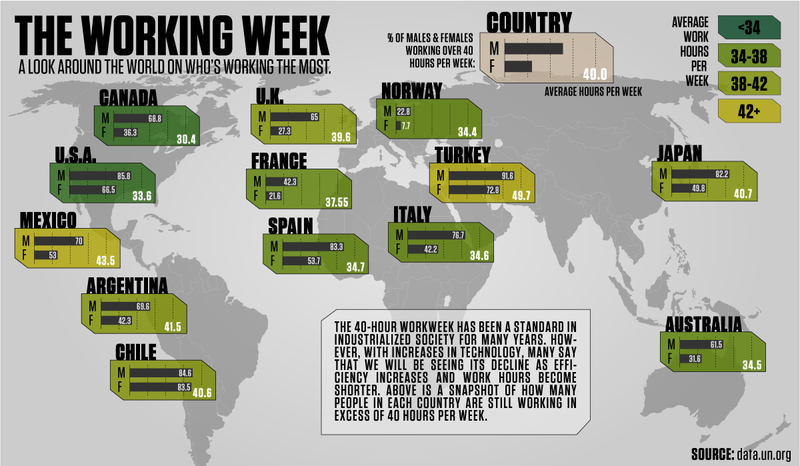 If you check out the chart above, you’ll notice that Americans are working far more than the classic–and now outdated–40-hour workweek. Eighty-six percent of men do it, as do 67 percent of women. Comparatively, our European counterparts have scaled waaay back. According to combined averages for both sexes, French executives work almost half as much as drones stuck in U.S. Cubicle Land. And they have figured out how to be tres productive. Of course if all this sounds familiar to you the grand irony is that Visual Economics actually posted this same map about a week ago pulled it down seemingly after typos were spotted. Let’s call that Exhibit A in the national argument for more vacation. Maybe the next time your boss docks you pay for poor performance you should explain that you just need more time off instead.